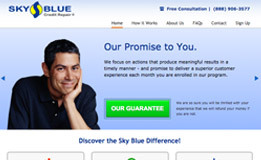 Those looking for a no-nonsense approach to credit repair will appreciate the services at Sky Blue Credit Repair. Their services are affordable and straightforward with no long-term contract to worry about. CreditRepair.com is an established and reliable credit repair company that has many years experience successfully removing bad credit while offering modern conveniences such as Web tools and a mobile platform to view account details any time of the day. Such technology does more than keep clients in the loop, as it can help to expedite the entire process by allowing decisions to be made quickly. The team of experts have 15 years experience helping people clear up issues regarding fraud, judgments, charge offs, inaccurate information and unauthorized inquiries. Their three step process is to check, challenge and change. A personalized approach is what separates CreditRepair.com from the competition. Clients appreciate the individual care. Though individual results vary, approximately 7% of questioned reports are solved each month, helping client gain financial freedom. They have a strong track record and reputation for assisting clients and getting real results. The company has an interactive website that provides help when live assistance isn’t available. It is a valuable source of information, tips and tools. You may also find their mobile application extremely handy during your credit repair process. CreditRepair.com continues to update their technology to bring you the latest and greatest advances in credit repair services. A personalized plan to repair each client’s credit. 24/7 access to account information. Communication by phone or email, as well as access to their mobile app. Assistance in understanding your credit score, credit reports and how to improve credit. There is a one-time fee of $12.99 to pull a credit report and then the service is $89.95 per month. Before you sign up, they will provide you a free consultation to help you decide if it’s the right service for your needs. The plan does not require a contract, so there’s no need to worry about cancellation fees or a long-term commitment. They also offer a credit monitoring service for an additional fee. This includes daily monitoring and will alert clients in the event of a change in credit score, new creditor inquiries or other abnormal activities that might take place. The more often you check credit reports, the easier it is to detect misinformation or fraudulent activity and stop it before it affects the credit score and limits buying power. In fact, CreditRepair.com takes it one step further to monitor children’s social security numbers in order to help thwart misuse or fraud. Signing up at CreditRepair.com is easy. Once they obtain a client’s credit reports from the credit bureaus they can help determine which items can be challenged, create a game plan tailored to the specific needs of each case and get started on the repair process right away. Their years of experience and expertise help people meet their financial goals and thus provide for a better future. A bad credit score affects many things, from the ability to buy a car or a home, interest rate percentages and even the ability to get a new job. Fixing a bad credit score can make all of these challenges easier and more affordable. No matter how good your intentions are, sometimes, you just can avoid being stuck in a bad situation. That is what happened to me last year when I lost my job. Before that, I had great credit and a great paycheck. However, once I lost my job, I couldn’t pay my bills on time and my credit just spiraled out of control – from 698 to just above 400! I was ashamed, but I couldn’t help it. Fortunately, creditrepair.com came to my rescue and was able to help get me back on my feet and repair my credit. Now, I’m back up in the 600s and super happy. If you are still wondering what you can do about debt, CreditRepair.com is the answer. They are honest and get back to you quickly. There isn’t a single reason not to call to see what they can do for you! There is nothing fun about finding out that you aren’t eligible for a loan. It just happened to me. But, thanks to Creditrepair.com, I was able to fix my credit problems and now I have been approved for my loan! You don’t have to live a life full of debt, confusion and hopelessness. With the credit repair services offered by Creditrepair.com, you can fix your credit and get back on the right financial track again. Have bad credit? It’s no problem, thanks to creditrepair.com. I was in the same boat as you and I can’t tell you how much creditrepair.com helped me. They fixed my credit and put me back on the right track. I never thought I could get my credit back into good standing, until I found creditrepair.com. Now my credit is repaired and I feel better about being able to spend my money instead of worrying. I was married and happy. Well that happiness turned to sorrow when my wife divorced me after 2 years of marriage. I thought I wouldn’t be any worse off and then I started getting phone calls from collection agencies and I found out my credit had been tanked. I felt low and about out of options when I read about creditrepair.com. They looked like a promising company and could help me so I gave them a call. They were professional and every time I talked with them I was a name, not a number. They helped me reduce my debt and I’m much happier. Thanks creditrepair com! I no longer have credit cards I can use because I was entirely irresponsible with them. That really irks me because I always intended on keeping my finances in check as I aged. Fortunately, companies like creditrepair.com exist to help people get back on their feet again. I couldn’t believe how kind and compassionate my adviser was. She spoke the truth but did it in a way that was respectable and polite. She helped me come to terms with my debt and even discussed options for repairing my credit with me. She made me a partner in the process which made me feel great. Knowledge is power after all and if you possess the tools that you need going forward, it’s easier to avoid financial downfalls and colossal mistakes. I now know how to manage my money better thanks to the good people at creditrepair.com. They educate never scold or make you feel like an idiot for your credit problems. I appreciate how honest they were with me but also how they treated me kindly and respectfully like I was not only a client but also a friend of theirs. If you want personalized service, go with creditrepair.com. You won’t be disappointed. A friend recommended creditrepair.com because they helped her, and so I thought I’d try them too. They were great and helped me reduce my debt and get my credit back in good standing. I recommend to everyone now. When I was a college student, I was fancy free, and enjoying everything that life had to offer me. This also included using my parents credit cards, so I never had to worry about my debt or my credit. Well fast forward 4 years and I’ve graduated with my college debt, I can’t get a credit card because I had one and blew it and now my credit is in the tank. I’d get a big F if this was graded. I had no idea that money issues would plague me when I got older. This lasted for a couple years with creditors and banks contacting me constantly wanting me to pay. I didn’t know what to do, and a roommate of mine had heard about a company called creditrepair.com. He said that his girlfriend had just been working for the past couple years to reduce her debt, repair her credit and that creditrepair.com was how she got it all done. She now has a better car and is looking at a new home. I wanted that and financial freedom so I called creditrepair.com the very next day. They were professional and helped me to repair my credit, reduce my debt, and make my life easier. The call was the right one and I’d grade them with an A+ for their services. 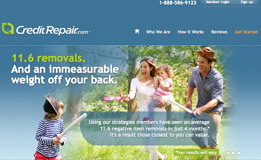 creditrepair.com was recommended to me by a family member who had been through her own share of financial distress. I was pleased with how the company conducted themselves while working with me. Not only were they friendly and knowledgeable, they asked the right questions which helped them understand my financial situation even better. We were able to come up with a plan that works for me. Credit repair services is something everyone in debt can benefit from. Trust me. When I think someone has done a good job, I let them know about it. In this case, creditrepair.com is top notch. CreditRepair.com is very effective. They and allowed me to get incorrect multiple entries removed, including negative public entries from the past removed from my credit reports. They also provided information to lower credit balances in the most effective ways to get my FICO scores to their highest possible. No wonder why my parents always told me to be mindful of how much I charged on my credit cards, because it did come back to haunt me. Thankfully, the damage I did was erased, because of creditrepair.com. CreditRepair.com is the cream of the top. Seriously. They do everything they promise and more. They’re the type of credit repair company that you dream of working with because they’re professional, understanding, and willing to go the extra mile for their clients. I felt like they valued my business because my adviser took the time to explain all my options to me. All I had to do to get the ball rolling is reach out to them and tell them about my credit situation. They were able to help me come up with a plan to pay off my debt and raise my credit score in the process. I know a good thing when I see one. After hearing about CreditRepair.com, I thought I’d give their credit repair services a try. I was surprised to find a knowledgeable and professional staff willing to help me start fresh once again. After listening to their advice, I devised a plan that helped me get out of debt and start building a stable financial future for myself. I can’t believe it really was that easy. If you don’t think there’s help for your finances, you’re very wrong. You just have to admit that you need assistance in order to head in the right direction. After my wife and I split, the stress was pretty unbearable. She had kept me completely in the dark and I had no idea the utterly cavernous hole she had left us in financially. She had bad credit from before we were married, so we put everything in my name. Now, there was no way that I could pay child support for our newborn son and handle all those bills by myself. After moving back in with my parents, I have since been much more stable and my mom referred me to CreditRepair.com so that I could get back on my feet. Honestly, it was embarrassing to deal with this mess, but they treated me with dignity and I was able to follow their plan and get out from underneath the pile of bills I didn’t even help to make. They were very professional and understanding. I would recommend them to anyone I come across. In fact, I already have! I had a buddy in a similar situation and he was able to repair his credit rather quickly by following CreditRepair.com’s plan. You never think it’ll happen to you until it does. I’m much better equipped to deal with my next divorce (just joking!). Credit card debt can really cause you stress. It did with me. Then I contacted CreditRepair.com. They helped me come up with a plan to pay off my creditors. My payments are lower and I can breathe more soundly at night. Learning how to get my debt under control was hard but necessary if I planned on getting on with my life after my divorce. CreditRepair.com was compassionate about my circumstances and made me feel like they cared about the outcome of things. After I switched jobs in 2009, I accumulated a lot of debt. There were movers and all of the expenses that come with moving. I thought it was OK at the time because I was moving to a better job with better hours and pay. Well, that job didn’t end up being all it seemed and within two years, I was without a job and unable to make payments towards creditors. It was a frustrating situation, but that’s just where my life was at the time. CreditRepair.com has helped me turn things around in record time. I still work, but I am not making as much money as I did once upon a time and that has made it difficult for me to get a handle on my debt. With CreditRepair.com they have shown me how to break up payments and have negotiated to get better rates on my interest. This means I am not paying as much per month but still making a serious dent in my debt. CreditRepair.com is the best credit repair company anyone can work with. They are nice and pleasant to work with and I never feel inhibited when I have to talk to them about my finances. There are few companies who still care about clients the way CreditRepair.com does. They make it a point to make you feel at ease as you discuss your financial problems with them. Every rep I spoke with after working with CreditRepair.com for 10 months has addressed me by name and is very aware of my situation because the previous rep has taken such meticulous notes. These things matter when you are overcoming debt and getting your credit score on the up and up. Without CreditRepair.com I know I would have never made the major improvements that I have and I’m thankful for them! I am not a fan of skimping or saving. It’s the honest truth. Because of this I ended up in debt which is the likely story for many people my age without a steady job. I thought creditrepair.com could be an answer to my prayers because they are the type of people who understand your perspective – a pretty important thing when helping someone overcome debt. From the first time I called creditrepair.com I knew this was the right place for me because they are honest and helpful. creditrepair.com is all about helping you be smarter with your money. creditrepair.com is tops! There is a point in your debt life when you realize that you simply can’t handle it on your own anymore. That’s where I’ve been for the past couple of months but I wasn’t sure where to go next. 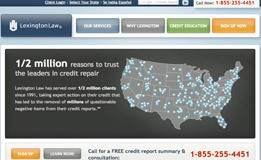 I read about creditrepair.com on a debt relief website. I wasn’t really sure what to expect going into it, but I decided to call since I didn’t really have anywhere else to turn. I am glad I did. This was the perfect move for me at this point in my career since I am making more money and want to pay my debt but do it in a manageable way. There is no reason to struggle with the aftermath of debt on your own. creditrepair.com has been the only reason I was able to get my credit settled in the amount of time that I did. There are a lot of payday loan companies out there, but I wouldn’t trust anyone but Creditrepair.com. When I needed cash fast, they stepped up to the plate. I’ve told all my family and friends how pleasant they were to deal with. Many thanks, Creditrepair.com! I didn’t know what to think about online lending when I first about it. It sounded too good to be true. Then, after hearing about a coworker’s nightmare dealing with a shady payday loan company, I was convinced it was too good to be true. Fast forward a few years. My daughter needed a loan, and I just didn’t have access to the money at the time. So I looked into finding a reputable payday loan company. It didn’t take me long to find Creditrepair.com. They are the most principled and fair lender to deal with. Everything was aboveboard, and their customer service was unbeatable. Thank you, Creditrepair.com, for being a tribute to your industry. The last time I needed a loan, I dealt with a company that was less than ethical. I couldn’t believe the rates they charged me, and all the hidden fees made my head spin! So this time around, I knew I wanted to deal with a company that was on the up and up. A coworker recommended I check out Creditrepair.com. They were upfront and honest with me from the get-go, and I knew right away that these were trustworthy folks. They also got me my money pretty quickly, which I very much appreciated. Creditrepair.com is one of the best payday loan organizations out there! creditrepair.com is a great credit repair company! I’m glad my friends recommended it to me! It’s made all the difference to my credit score! Here’s an important tip: Don’t just sit there! Take action. It’s worth it! All my credit problems have finally been fixed after like a decade of struggling! Yay! The thanks goes completely to creditrepair.com. They used their skills and savvy to dispute item after item from my credit report. I’ve only been signed up for their service for like half a year (if even that long), and I can already see the results. And they’re not even done! I’m planning to stay signed up at least another 6 months. The goal is to eventually see my credit score hit the upper 700s. In the meantime, I’m being patient and just watching as they do their magic! I’ve always wanted a boat. My credit prevented me from being able to finance the boat of my dreams. After working with CreditRepair.com for six months, I will soon have my boat, and I could not be happier.